I used the 2007 pond cleaning page as a guide to write this 2008 one but did change everything that was relevant or changed. 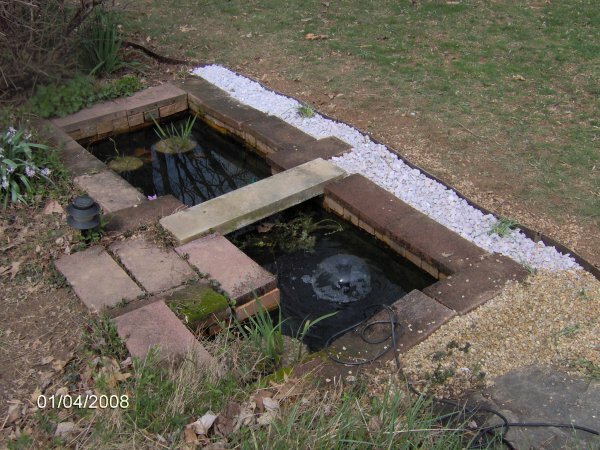 On 4/1/08, I cleaned out my 153 gallon pond. It went pretty much as planned. I got up at 6:30 am and finished the morning animal feedings at 8:13 am when I started collecting supplies. The air temperature was 54 degrees F but it was raining. I put on a baseball cap to keep the rain off my glasses. I had a rain slicker just in case but the rain was never more than a spritz or light drizzle. The 153 gallon thermometer read 48 degrees F. I was ready to start bailing at 8:49 am. I bailed water into my two old kiddie pools, the smaller kiddie pool, and two holding buckets (one for the fish, one for the frogs). The rosy red population was good this year but I only found three frogs. 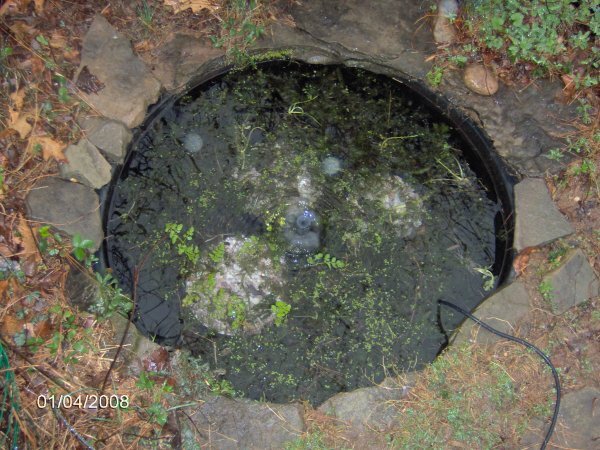 The bottom of the pond was full of the aquatic plant soil and pea gravel because the raccoons had de-potted most of the pots and made a huge mess. I got an entire bucket of gravel off of the marginal area and another two buckets in the deep end. I cut some plants down around the pond by standing in the empty pond. 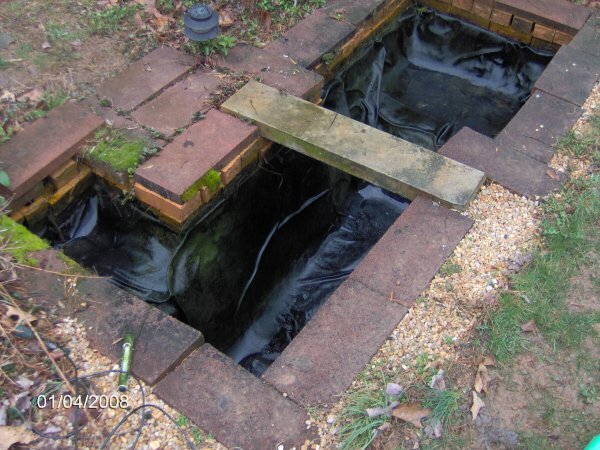 I replaced three bricks under water that had fallen apart. After the pond was vacuumed out with the Pondovac, I refilled it to the level it was from the bailed water. There was a problem. In order to get water that had gone through the sediment filter, I had to run the 50 foot hose from another spigot further away. This was the same hose I had used eight days earlier to refill the tub ponds without a problem. This time, however, all this white gunk came out. I assume it is dead fungus or bacteria that was in the hose. I turned off the water, pulled the vacuum back out (I had put it on the porch), and sucked up the gunk. I then turned the water back on and got more white stuff. I sucked that out again. Finally, I took the risk and filled it to the top marginal shelf even though that white stuff kept coming out! I added the following additives: about 0.5 cups of pond salt, about 30 mL of aquarium Stress-Zyme, about 50 mL of pond Stress-Coat (they no longer sell it; it was leftover), a half teaspoon of BZT, and a dusting of baking soda. I got the PondMaster filter and bell fountain going and let the Luft pump heavily aerate. I put the water in two of the kiddie pools back (only one had animals in it). I went to eat lunch at 11:55 am with the pond mostly refilled. I went back out to continue working at 12:20 pm. I ate in under 10 minutes but then decided to put up the pond vacuum and some of the supplies I was done with as it is a lot of work to put them all up at once. I repotted all the plants (details below). I used a half a bag of pea gravel and a huge bag of the aquatic plant soil. In order to place the two lilies in the deep end, I took off my boots and socks and put on beach shoes to get into the water. All the saved water, submerged plants (okay, like three sprigs of anacharis), snails, tadpoles, insects, fish, and frogs were back into the pond by 1:11 pm. The water temperature was up to 58 degrees F. I put up most of the stuff that I had hauled out. By 1:46 pm, I was ready to start work on redoing the edging around the 153 gallon pond. The old edging was in sections and basically all out of the ground. I had to dig out a ton of weeds, dirt, and old pea gravel. The crab grass was the worst. I had to dig it up with my Allium and grape hyacinth bulbs and then replant those. I got this new edging stuff in a single 20 foot strip. It was rolled up and wanted to stay that way. I had to wrestle it into place and dig it into the ground! I beat it senseless with a hammer. Once it was in place, I lined the side with pink quartz gravel and the end with small pea gravel. By 3:07 pm, I was ready to put the rest of the stuff up. The temperature was up to 70 degrees F but with some strong winds. I hit the shower around 3:30 pm, then came to write this, do my e- mail (not all of it), a half hour of my regular afternoon chores, Tinkie (my kitten) to the vet for shots, dinner, more e-mail, and finally TV. 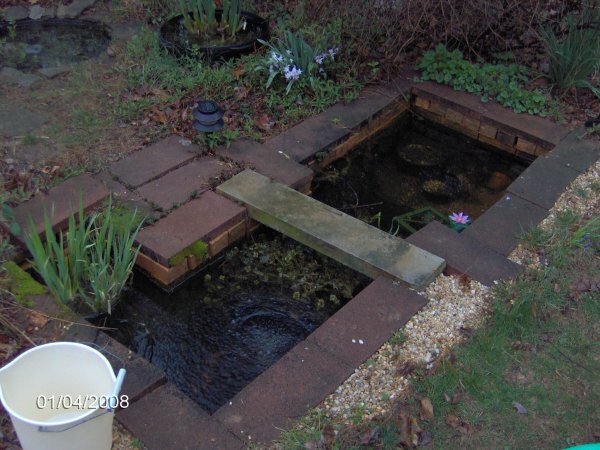 The pond had only about three sprigs of anacharis left and no hornwort. There was a huge clump of terrestrial mint growing into the pond. I decided to put it back in to provide cover for the tadpoles and some plant filtration. I used the Shultz Aquatic Plant Soil this year to repot all the pots in the 153 gallon pond. I pre-wet the aquatic "soil" in one bucket and pea gravel in another. I filled each pot with the "soil" and then put in the plant, a PondTab fertilizer pill (one per gallon), and topped off with pea gravel. Because iris bloom in May, in repotting them in early April, I get very few flowers. On the other hand, the one living iris pot was really overgrown so I needed to keep things under control. Here are the plants that I repotted. I started with five pots. One was the blue iris which was in great shape and sits in the small marginal shelf by the overflow (it takes up the entire shelf). 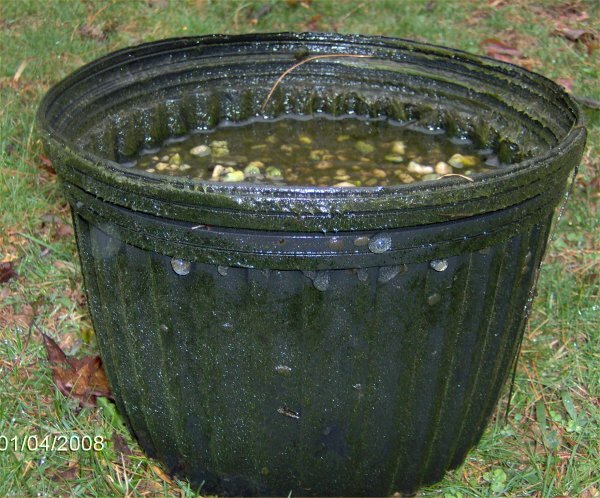 In the deep end of the pond were one two gallon pot and one one gallon pot. The two gallon had a strong waterlily tuber, probably Albata white waterlily. 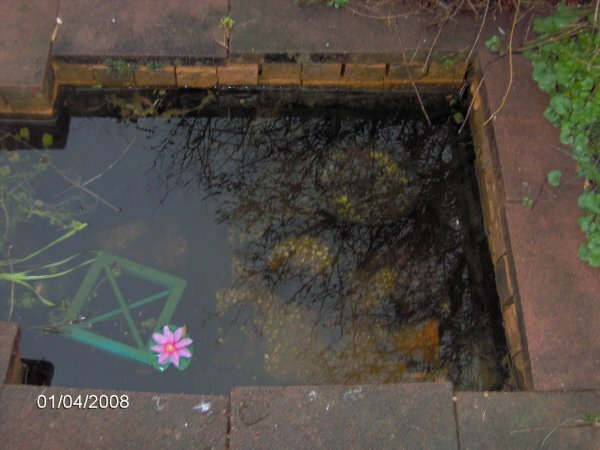 The other waterlily was dead and spungy. To replace that one, I had a pink WalMart lily that was actually alive (although the smallest living waterlily I have ever seen!). In the main marginal area, there were two one gallon pots. All the pots were dumped there and empty basically. I found two loose pieces of sweetflag. Three small pieces of anacharis. A huge clump of terrestrial mint. One two gallon pot with a waterlily in the deep end. It is probably the Albata white lily since it is the most vigorous. This lily had a huge tuber. One two gallon pot with the WalMart red waterlily in the deep end. One one gallon pot with sweetflag. 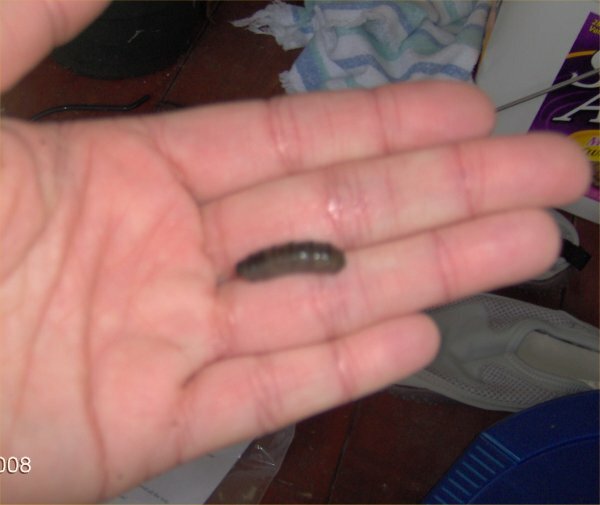 There were two sweetflag tubers floating loose in the pond which I stuck in the pot. 31 rosy red minnows (down from 48 the previous year) - approximately 10 males, 18 females, and 3 youngins. There were very few babies this year. 2 green frogs - one male and one female. 1 mega-huge male bullfrog of the ultra scary sort! 30 or so ramshorn snails, mostly babies. A dozen or so pond snails. 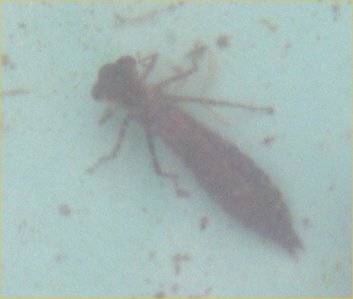 4 dragonfly larvae (one big one, three small ones). Also, the male wood frog was calling in the 20 gallon tub pond while I worked and later moved to the 50 gallon tub pond. When I had refilled the 153 gallon pond later, a little 1.5 inch baby green frog showed up! I do not know where he came from! There was also a male green frog in the 50 gallon pond who later came over to the 153 gallon pond. All of these photos and video were taken on 4/1/08. 153 Gallon Pond- 5170 KB, mpg movie. A longer video showing the 153 gallon pond empty and what I have in the other containers. It is truly not exciting. 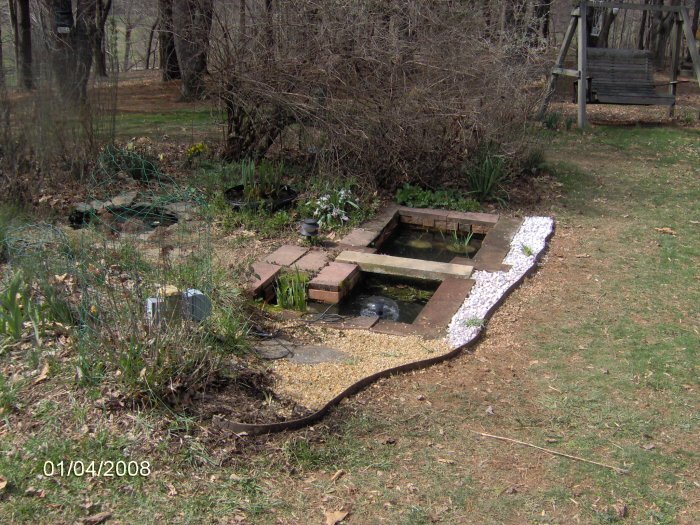 This video shows the pond when it is refilled and done including the new edging I did and the 20 and 50 gallon tub ponds nearby. All of these photos are from 4/1/08. 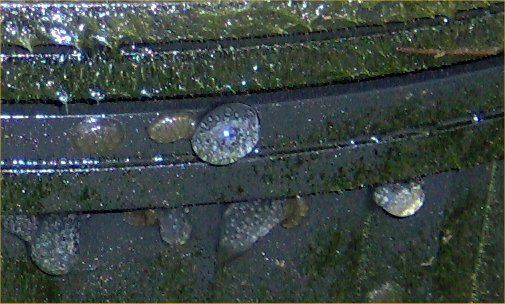 Snail eggs on a one gallon Lerio pot. They are probably ramshorn snail eggs. 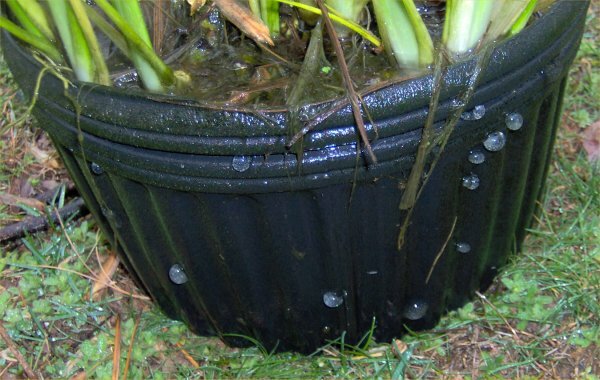 Snail eggs on the two gallon pot with the blue iris. 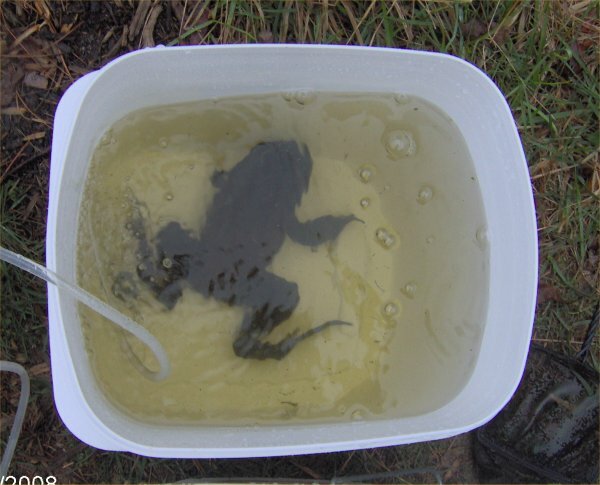 Huge male bullfrog sitting in a cat litter bucket. He fills up the entire bucket!